36 watercolours in a large Chinese traditional handmade dark blue silk covered album. The watercolours vary very slightly in size but most measure approximately 30 x 58.5cm. Each painting is surrounded by a plain paper border framing each painting on the page. The album measures 34cm x 67.5cm. (circa 1860). A rare and profoundly important album of paintings by an unknown Cantonese artist. 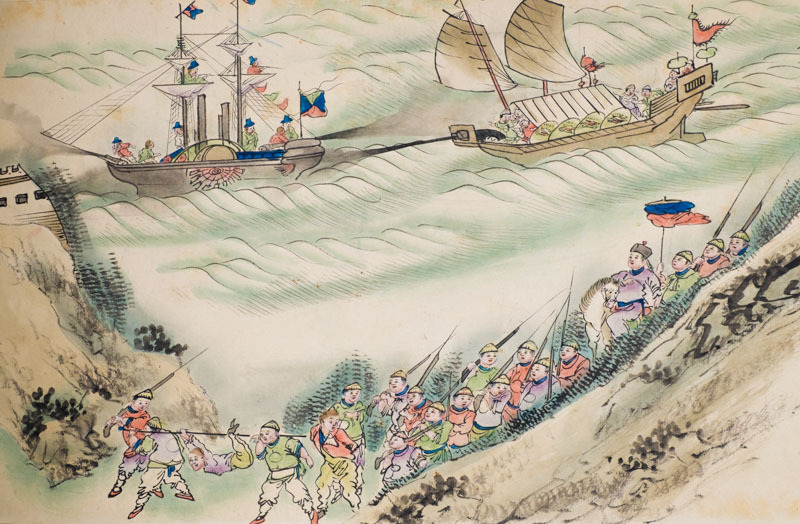 Half the paintings in the album depict the old trading relationship before the First Opium War, when merchants from the West traded with China on China’s terms. 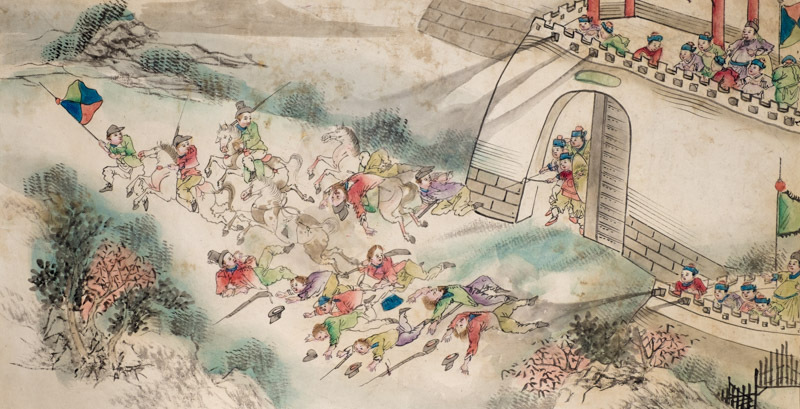 The other half epitomize the changed situation in which Chinese artists were either directed, or chose, to hide a disastrous war behind a series of triumphant representations of successful military encounters which were almost all pure fiction. These paintings show such fictious events as the capture of Captain Elliot, RN the British Chief Superintendent of Trade. Interestingly, all save one of the 36 paintings relates to the Canton area of Guangdong. The Canton connection is further strengthened by the texts which appear on some of the paintings which show signs of being Cantonese in grammar and composition. Moreover, the album’s provenance is from Canton.